When I began Baby Meets City just over 2 years ago, SITS was one of the first websites I landed on. Basically, I wasn't sure what the heck I was doing, but I was intrigued by the new community I had discovered online and excited to be a part of it. These days, I suppose I'm yet another "mommy blogger," but the truth is, while the definition varies, I'm more than happy to own up to it. The reason is simple -- this blog has given me a creative outlet that I was craving. I don't have the opportunity to write in my full-time job, so in a sense, blogging helped save my creative side. Writing again on a regular basis has given me a renewed sense of purpose and a motivation I was lacking. ... and for that I am IMMENSELY grateful. In a way, to finally have my "SITS Day" means I've come full circle. 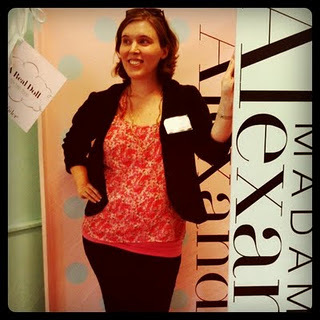 I remember signing up for this special recognition and then totally forgetting about it as I became more involved with my own blogging, reading other great blogs and attending events for bloggers here in NYC (that's me below at the Madame Alexander doll factory- so fun!). To receive an email last week saying my SITS Day was finally here, well, that's like icing on the cake. I so appreciate this recognition, and it only inspires me to keep moving forward. Thank you, ladies of SITS! Last, but certainly not least, I'll save the biggest thank you of all for the 2 little ladies you see below. Baby Meets City began as a way of sharing my adventures in urban parenting in NYC, so if not for Toddler S I would probably still be spending my downtime twiddling my thumbs. Thanks to this sweet gal (naturally I'm biased), I no longer have any downtime at all. BUT- I also have an endless amount of things to write about. We all know life changes in an instant when you have children, and mine is no different. I am endlessly grateful for the blessings I've been given... my babies are happy and healthy, I have a supportive and generous partner in Husband, and I've enjoyed the experience of living 10+ years in the best city in the world... which happens to be more kid-friendly that you might expect! Now that Baby Sister has arrived, our lives have changed even more. The adventure continues, and I do hope you come back again to join the ride! Congrats on the new baby! I have family in NYC and have never thought my kids would enjoy visiting, but you've changed my mind thanks! Happy SITS day! You have a very beautiful family! I have never been to New York, but would love to come there! Hopefully someday I will get to explore the state. I am going to look around your blog...hope you have a wonderful SITS day! Well congrats on both your SITS day and your new arrival!! What an exciting few days :) And good luck re-learning the whole BFing/typing juggling act! I'm not sure how I could possibly be the first or second comment but I'm stopping in from SITS to wish you a hearty congratulations on your beautiful new baby. I'm really looking forward to your blog - I'm such a country mouse myself. Big city living seems very exciting! I found SITS the same way about the same time--just over 2 years ago. It's funny how life can bring you full circle! Congrats on your SITS day! I had a similar experience with my discovery of SITS, and I have yet to have my SITS day. It is an amazing site to meet new bloggers!! I am also living in NYC, though I am a student without children, but I've often wondered if NY would be the place I would want to raise my children. I would love to check back in with your blog & see your insight into parenting in NYC! Congratulation on your brand new baby girl....your girls are so precious. NYC was my favorite place to hang out when I was in college and living on the east coast. I miss it! Congrats on your SITS day! Your girls are gorgeous! A beautiful new baby AND a SITS feature all in a few days? I imagine that makes for one very busy and very awesome week! Congrats on all the good that's going on!!! I am so excited about this blog. I'm from Nebraska & Kansas (currently the latter) so it's going to be awesome to see your take on mothering in a completely different environment (way cooler environment, I'm sure). I really enjoy your perspective on raising a family in a large city. My husband and I moved from New Orleans to a suburb of Nashville after our first was born. 99% of the decision was based on not wanting to raise our children in an urban area. It's nice to see someone try, succeed and even enjoy it. Though we adore where we live now, we never even gave the city a shot! Happy SITS Day! Holy Moly - I can't even BELIEVE that you have time to do this less than a week after having #2. You're basically my blogging hero now. :-) Count me in as your newest follower - we NYC area mommy bloggers gotta stick together! Happy SITS day! And belated congrats on your beautiful new baby, so much excitement and happiness - I'll look forward to reading about it all on your blog! Congratulations on the darling new little lady! I am so intrigued by your blog. I'm raising my boys in small town Midwestern America. Just the thought of raising children in a huge city intimidates me. Happy SITS day and congratulations on your new baby! You have a beautiful family! Beautiful girls - really neat blog you have going on here - I can't imagine raising babies in the city but I am off to read about it! HAPPY SITs DAY! Happy SITS day! Adorable pics and I love the look of your blog! CONGRATS! - on both your SITS day and the new baby! Happy SITS day and congrats on your new baby girl. You have two beautiful daughters. Enjoy your day!! Happy SITS Day and big congrats on the arrival of your sweet baby daughter! So, you live in NYC, huh? There is a possibility that we might have to move to the 'burbs of NYC in the future IF my hubby gets a job offer he's been hoping for. We now live in GA. and I've lived in the South all my life. I can't imagine living in city as large as NYC! I am now a follower...can't wait to learn more about you and your adventures! Happy SITS day! And congratulations on the new baby! Congrats on your SITS Day! I'm following now and look forward to getting to know you! So cool that you review books & are a mommy blogger, bc that means we're on the same books, altho I review YA, but I do love kids books since I have 2 of em haha. Wow! Great days indeed! Great idea for a blog! Do you have any local advertisers yet? You should!!! Happy SITS day - congrats on your new baby!! Happy SITS day! And congrats on the new baby...and for blogging for two years! Pretty incredible. Congratulations on both great events!!!! Pretty cool week, I'd say! Cute kids and great blog! Happy SITS day!! What a lovely blog! :) I have to admit- I come from a theatre background and there was a big push for me to move to NYC after I graduated and I've always been hesitant to because I'm scared of having to raise a family there at some point. But clearly you're not only doing it but doing it amazingly! I cannot wait to keep snooping around. Happy SITS Day and congratulations on your new bundle! I lived in NYC for a while after college and I have to say, I couldn't imagine having kids there! Bravo to you! So glad you were featured. I LOVE blogs about life in the city. I have always wanted to live in New York. However after a year in Addis Ababa, I am not sure I am cut out for City life. Congrats on your SITS day and congrats on the baby. Adorable kids and you look great in the hospital pic! I love reading about life in NYC. My husbands job moves us every 2-4 years and I keep hoping the next time it will be NYC. I think it's extremely kid friendly and provides such great teaching opportunities and tools for parents. Happy SITS and keep up the good work! Happy SITS day! I hope one day to at least be within train distance of NYC -- so many great places to spend time with kids. Congrats on your new addition. Adorable girls! Congrats on your SITS day! I can't wait for mine :) Love your blog - it's so cute! Very nice job. Happy SITS day and Congrats on your new baby!! Happy SITS Day and Congratulations on your new little one! Happy SITS Day and congrats on the new arrivial. Oh wow! Congratulations on the newest addition!! I agree with you about mommy bloggers. I am proud to be one too and I love it, regardless that I'm not original. A very Happy SITS Day to you Ellen! They are adorable Ellen and congratulations on the new addition to the family. Thrilling isn't it? Happy SITS day. See ya later. SITS day AND a new baby? You're winning all around! Happy SITS day - and congratulations on your beautiful new baby! 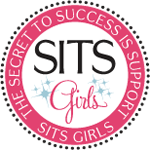 Congrats on your SITS Day Ellen and also on your new baby girl!!! Your girls are darling:-) Have enjoyed reading your blog over the last few months!! Congrats on the new baby AND your SITS day! Happy SITS day! I'll be sending the girls a package tomorrow morning! Congrats on the new baby and your SITS day. Congratulations on your beautiful family and happy Sits day! Wow, a new baby and SITS Day all rolled into one. Brilliant. Congratulations, and looking forward to having a look around. I love it! I grew up in NYC and always wonder how do moms do it up there?! I am so looking forward to finding out from your blog! Stopping by from SITS! Felicitaciones on your new arrival and on being featured today on SITS. You have an adorable family! Congrats on your Sits day! Loving your blog. Congrats on the the new addition AND your SITS day. I tip my hat to you for being with it enough to even check your email so soon after baby #2, much less be ready for such a big day! Happy SITS day!! 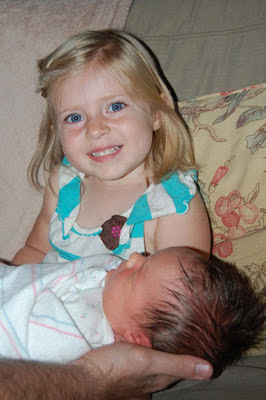 I just discovered your blog a few weeks ago, shortly before Baby Sister's appearance. Congratulations! Happy SITS day. I'm not a mom but a native New Yorker! I'll be back from time to time to check on your blog that's set in the greatest city in the world! Happy SITS day! I love your point of view: I don't think I've stumbled upon an urban parenting blog before. Happy SITS day! I had fun visiting your blog. I love NYC and wish I lived there. I think it's great to see families raising kids in the city-I know a lot who do, but it's shocking how many people are against it. Maybe one day I'll be there! Congratulations on a little October girl! (I'm one, too, so I'm naturally biased.) Looking forward to poking around your blog. What a fabulous header you have! Happy SITS day! Your oldest looks so happy to be a big sister. Congrats on the new baby. Beautiful picture. Congrats on your SITS day and the new baby! Enjoy this joyous time! Awwwww, what a sweet blog you have here! Well, it seems congrats are in order--both on your SITS day and on your new arrival! Your children are absolutely adorable. Congrats on your SITS Day Ellen! Who took that FABUSH picture of you at the doll factory? Someone very talented I suspect. PS: can you PULEASE turn off your word verification? Congrats on your sits day and your newest little one!